ProMountings is the original leading US company in commercial and residential punching bag mounting systems and fitness equipment. They manufacture high quality punching bag mounts (punching bag hangers) for heavy punch bag hanging, pull up bars, and boxing equipment. ProMountings designs and manufactures specially designed pull up bars for I-beams and vibration absorbing punching bag mounts for I-beams and rafters. These unique heavy bag mounts are designed for both commercial gyms and in home gyms. Rafter Mounts are Designed to Absorb Noise and Vibration for Heavy Punch Bags up to 200lbs. With ProMountings proprietary compressed spring design, the Rafter Mount will withstand thousands of strikes for a lifetime. Every strike is absorbed my the springs inside the Rafter Mount which helps absorb the vibration going into the floor joists. Installation only takes a few minutes and is super easy! NB.Follow the links below for more information including data sheets and installation instructions. Up to 120 lbs bag. 130 - 200 lbs bag. 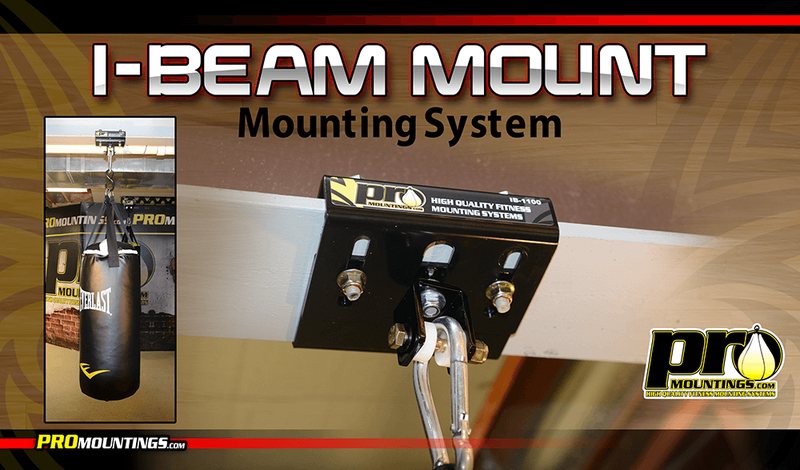 The ProMountings I-Beam Mounts are static mounting systems for punching bags up to 260lbs.The punching bag mounts are the sturdiest in the industry and built to last a lifetime. The I-Beam mounts won't cause any noise or vibration. Simply slide the mount onto the I-Beam and tighten the bolts and nuts. Installation takes less than 5 minutes! No drilling and no mess. NB.Follow the link below for more information including data sheets and installation instructions. ProMountings I-Beam Roller Mounts are adjustable rolling and/or fixed mounting systems for punching bags that weight up to 260lbs. They roll across the I-Beam as you work out, or you can quickly lock them into position for a static workout and roll them out of the way when your done. Order by the size of the I-Beam. The Ceiling Mount is the best punching bag mount on the market for absorbing noise and vibration. With gas spring technology, each strike is absorbed and stops the vibration from going up into your joists or concrete. If you are looking for the best noise reduction mount, the Ceiling Mount is it! The gas spring allows the punching bag to be buoyant and reduces noise completely. Each order is equipped with the hardware and easy to follow directions. 70 - 130 lbs bag. 140 - 200 lbs bag. The ProMountings RM2000 Punching Bag Recessed Mount is the first of its kind. Now you don't have to worry about your long MMA bag hitting the floor. Gain more space from the bag to the floor with the RM2000. Our Recessed Mount is the quietest yet. With a sleek design and propriety spring mechanism, the Recessed Mount will surely exceed your expectations.